Every autumn and winter, hunters from this craggy Japanese fishing village corral thousands of dolphins into a tiny, isolated cove and kill them for meat and fertilizer, turning the water red with their blood. And every year, foreign animal rights protesters converge on the town, interfering with the slaughter, clashing with fishermen and broadcasting grisly photographs of the slayings around the world - all without stopping the hunt. Now, Japan's dolphin hunters face a new, powerful opponent: mercury contamination. A series of scientific studies in recent years in Japan have documented high levels of the toxic heavy metal in dolphin meat, and a group of city councilmen in Taiji launched an unprecedented campaign against the hunt several months ago after doing their own tests. A leading regional supermarket chain has pulled dolphin from its shelves over the health concerns, and hunt critics in the town say villagers are shunning it. Meat from pilot whales - a type of dolphin - was taken off local school lunch menus in October. "The mayor says we've caused 100 million yen ($1 million) in damages to the industry, but I don't know how that's calculated," said Junichiro Yamashita, a city councilman spearheading the anti-hunt movement. "They say the business is important for Taiji, but we say that health is more important." Indeed, while animal rights arguments against the hunt have fallen on deaf ears in Japan, the threat of mercury contamination strikes a chord in a country where food safety is rapidly becoming a paramount public concern. Though no mercury poisoning cases from dolphin meat have been publicly documented in Taiji, such contamination resonates loudly in Japan, where thousands were killed or crippled by mercury poisoning in Minamata in the 1950s and 60s. 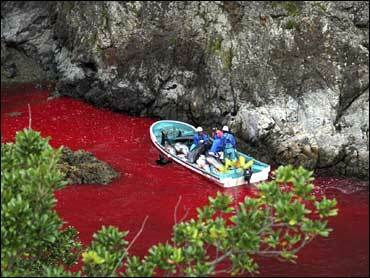 Taiji is one of several Japanese villages where dolphins are hunted. The town this season has a nationally set quota of 3,015, of a total national quota of nearly 21,000. The actual take tends to be about 30 percent lower than the quota, depending on demand for the meat. While other villages usually harpoon their quarry out at sea, the particularly bloody killing methods in Taiji have made the town a focal point of animal rights activists worldwide. The village resents the attention and accuses outsiders of interfering with a hunting tradition of hundreds of years. Standoffs between protesters and hunters quickly boil over into arguments and threats. The town erects barriers and hangs tarps to block activists from photographing the kill, and daily hunts can be canceled if foreigners are seen in town. "No, thank you," said an official at the fisheries union when approached for comment on the hunt. "You've come at a bad time." The recent findings on mercury levels, however, have given pause to many would-be consumers. Tetsuya Endo, a researcher at the Health Sciences University of Hokkaido, in northern Japan, has co-authored numerous studies showing dolphin meat can contain mercury at concentrations many times higher than the 0.4 parts per million allowed by the Japanese government for many types of fish. The highest concentration he has found so far was 100 parts per million from a bottlenose dolphin - a species whose meat is butchered in Taiji. "This ought to be investigated," Endo said, calling for a government probe into the dangers of eating dolphin. "There are people who eat it a lot, and those people could be suffering health effects." The threat of mercury contamination, however, failed to cause a stir in this isolated village until Yamashita, irked by the town's plans to build a $3 million dolphin slaughterhouse and spread the use of local dolphin meat in school lunches, decided with allies to conduct their own probe. The results on tests of three locally bought pieces of dolphin meat at a government-run lab confirm their fears, he said. The pieces of meat taken from pilot whales were all many times the 0.4 parts per million threshold. One piece logged 11 parts per million of mercury, and 2.6 parts per million of PCBs, an industrial pollutant that Japanese regulations limit to 0.5. Yamashita and his allies announced the results in a handout distributed with local newspapers, and he expanded his crusade by appearing at a news conference in Tokyo for foreign reporters - a move that angered village elders and hunters. "They said that if dolphin hunting disappears, then Taiji will disappear, but I say it's important to look at developing other industries," he said. "They're upset that I showed this to the outside world." The anti-hunt movement, however, faces substantial hurdles. The Taiji leadership - only three of 10 councilmen oppose the hunt - is clinging to plans for the new slaughterhouse, counting on sales of dolphin meat outside the region, where the mercury concerns have not spread because of lack of national media attention. Captured dolphins are also sold to dolphin aquariums in Japan and abroad, at substantial profit. Taiji has powerful contacts at the national level. Lawmaker Toshihiro Nikai, a top executive of the long-ruling Liberal Democratic Party, is a native of the prefecture where Taiji is located, and he recently visited the village. Campaign posters of him can be seen around town. Tokyo - which is also battling international protesters over its whaling program on the high seas - is not getting involved in the dolphin dispute, despite a Health Ministry survey in 2003 confirming high levels of mercury in the mammals. The Fisheries Agency in 2005 upgraded a 2-year-old advisory to urge pregnant women not to eat dolphin more than once every two months. In any case, the 0.4 parts per million limit on mercury does not apply to dolphin meat, and there are no plans to strengthen the guidelines, officials said. "We are aware that mercury content is particularly high in dolphins," said Yuichiro Ejima, a food safety official at the Health Ministry. "But ... most Japanese seldom eat the meat, except in some areas where dolphins are caught traditionally."